Follow the money and you can typically arrive at the genesis of your surroundings. Here is another ratio chart that utilizes the S&P 500 Bank Index from Goldman. While I usually watch the BKX or the XLF for baromarket pressure differentials (yes - I did just create that terminology), the GSPBK goes back a bit further and yields greater perspective to the ratio. As you can see, the banks considerable underperformance over the past year has become a worrisome trend. And while the previous bear markets (1990 & 2002) had similar low pressure zones - they eventually snapped back with great strength to lead the broader market higher. Granted, they eventually rolled over with some similarity to the current ratio's technical predicament - but it was after a much stronger relative performance trend. This has everything to do with the interest rate environment transition we are approaching. As described in my previous work on the transition to a market environment with a less accommodative Fed - both the 1994 and 2004 tapes exhibited diminishing leadership from the banks. 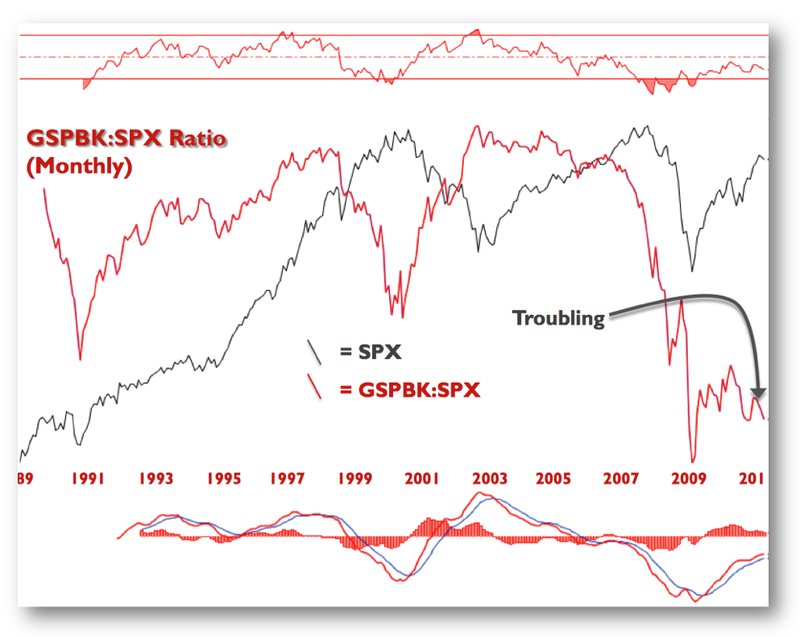 The conundrum is that the ratio is running out of downside field position. More to come in this line of thinking.